When The Amazing Spider-man run ended at issue 700 I was a bit weary about where it would go next. Peter Parker was dead, Octavius had his mind in Spideys body and for all intents and purposes that could have been the end of the Spider-man comics. Spider-man defeated by Doc Oc in his last battle and then it ends. 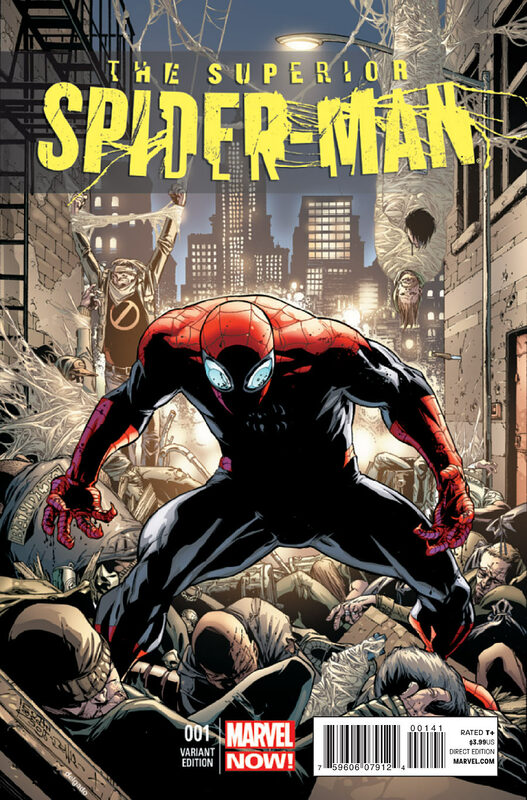 Now however we have the Superior Spider-man series which pretty much picks up from where “Amazing” left off. I’ve been following this new run all year and I have to say that I absolutely love it. In my opinion it is by far the best storyline that Spider-man has had in quite sometime. We have Doc Oc running around trying to be a superior Spider-man and whilst he’s saving people and putting the villains out of business he’s doing it in the most polar opposite way to what Parker would have done. So far we’ve had Spider-man kill Menace, create his own army, build robo-spiders, sever all ties with MJ, create some form of alliance with Jameson and we’ve even witnessed the mind of Doc Oc battle the conciousness of Peter Parker. All in all it’s making for some great reading. On top of that, the art work is phenomenal as it always is. My only question is how long can this arc last? I’m thoroughly enjoying it and each issue is better than the last and occasionally we get a fantastic cliffhanger which makes me so impatient for the next issue that I attempt to draw my own. Although I have to admit my attempt at drawing Spider-man swinging through the streets looks more like a hot-dog lying on a bed of spaghetti. There’s only so long you can keep Peter Parker dead without losing an army of fans. For me I don’t see it ever getting old, I am completely loving this new set up. It takes Spider-man to a whole new darker level but at the same time it keeps many of the fundamentals of the character. Gone however are the comedic one liners, which is mentioned a few times in the series. We also have the face off between Spider-man and the Avengers when they figure out that something isn’t right. That alone is an issue worth buying, not for the Avengers but for the writing of it. It’s all very anti-climatic but in a good way as it opens even more doors to the series.